Gisèle Trudel is an artist. 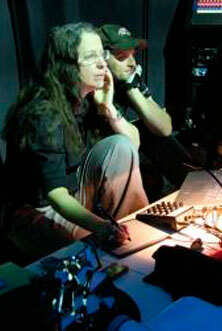 In 1996, she cofounded Ælab, an artistic research unit with Stéphane Claude, who is an electroacoustic musician and audio mastering engineer. She is also Professor at the École des arts visuels et médiatiques, Université du Québec à Montréal , Director of Hexagram-UQAM, the Centre for Research/Creation in Media Arts and Technologies and Co-director of Hexagram | CIAM, the Interuniversity Centre for Media Arts. Ælab’s commitment to collaboration, creative dissemination, innovative use of technologies are ways of thinking and doing that try to bridge the arts with processual philosophies and the sciences. Their process-oriented investigations creatively engage art and technology as intertwined ecologies. Their work is presented regularly on the international art scene.